EA Sports picking up the UFC license from THQ was arguably the single biggest surprise announcement to come out of E3 this year. It’s been widely recognized for some time now that THQ as a company is in dire straits and – like Take Two and their handling of sports – they have a desire to get out from under the significant costs inherent in licenses. Still a transfer of the license would have been seen as a long shot particularly considering the disdain shown towards EA in the past by Dana White. According to Gamasutra the primary reason THQ decided to sell off the license was because they were losing money on the deal. Apparently UFC Undisputed 3 would have had to sell two million copies just to break even and it fell well short of that mark. The expectation of two million copies – and more if they actually wanted profitability – was an unreasonable one. While the series debut with UFC 09 exploded onto the scene with over a million copies in its first month alone the follow-up one year later with UFC 2010 saw a massive drop to just 414K copies its first month. Even after spacing out the releases by letting nearly two years pass UFC Undisputed 3’s prospects for achieving significant growth were grim. In fact it slipped even further only drawing about 340K copies its first month. The tremendous success of UFC 09 just wasn’t going to be recreated no matter the circumstances and ultimately the company was unable to recover. 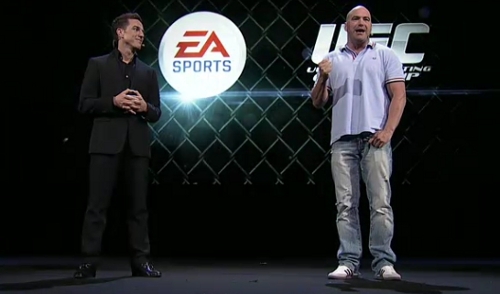 EA believes they can leverage their own brand and the popularity of the UFC much better. It’ll be some time before that is proven true or to be wishful thinking based on a consumer base that shrunk for THQ by a staggering 70% in the four years they handled the UFC license.